The Broncos are playing top notch football lately and will do so as long as Peyton will be there. The Chargers have looked like a different tab this year offensively but have to play a bit better to keep up with the likes of the Broncos. It’ll be a shoot out between Manning and Rivers. Take the Chargers +9 because while 9 may be feasible against most of the NFL for the Broncos, the Chargers won’t be that easy. Also, take the over, the Chargers will step up on a showcase night since they will have now recovery time until their next game. Broncos 31-27. The Texans go into Pittsburgh on a 2 game skid. They are 1-2 on the road and the offense has been all ground game and Arian Foster. Fitzpatrick has shown leadership in close games and has shown he can sustain some long drives but isn’t going to have that massive 300 yard game. The defense has helped but it is not dominating like everyone thought it would be. Yes, Clowney went out early in the season but they practically have the same defensive line as last year and have only 10 sacks with Watt having 4 of them. They have games with 1 or none and they dumped a ton of money on Watt and a 1st overall, 1st round draft pick on Clowney. There is a possibility that Clowney may return tonight but if he does, how effective will he be and how much will we see him? The Steelers are 25-2 on Monday night at home and 8-0 of those at Heinz Field. However the Steelers haven’t been that impressive, especially their defense. They are older, slower and can’t hang with the young speedy receivers that are beating them. Big Ben has been picking it up since weeks 3, 4, 5 but hit a wall last week against the Browns. Speaking of Brown, Antonio Brown has been their star catching 5 of Ben’s 8 TD’s. The two-headed rushing monster of Bell and Blount in the back field has helped. The offense ranks 8th in passing and 4th in rushing but are 31st in the league in the red zone. The Offense is there, the defense is not. The defense will have a hard time against the Texans rush game. Watt will have a tough time getting to Ben but if he does he will have a doubly hard time bringing him down. Colin Cowherd went 3-2 yesterday and yes, it turns out that the Chiefs/Chargers game was a trap bet and we now know that the 49ers can’t fill major defensive players’ roles with more than 2 defensive stars being out, I thought they would. EDIT NOTE: I updated the point spread since Covers.com was down late last night and early this morning. My Picks will stay the same. Jake Locker is still questionable to play, Whitehurst can do everything Locker does except he may not get hurt so easily. Both have roughly the same completion percentage and yardage. I don’t consider neither of them to be competent long term starters but can get the job done from time to time. The issue for the Titans is that their 2 quarterbacks are helping the team average 228 yards a game while the rushing game is a brighter spot but still only averaging 67 yards between the rookie Sankey and veteran Greene but averaging as a team about 116 per game. Don’t expect too much with either QB in, as the Redskins defense have been terrorizing opposing QB’s. The defense for the Skins has held up through the awful 1-5 start but have stayed in some games but it’s tough to do when the defense spends more time on the field than your offense just about every game because the offense turns the ball over a ton. The turnover differential is probably the root as to what has help this team spiral out of control. They have given the ball up 13 times and have only taken it away 4 times. The defense plays well early in games and can reach the QB early but when they are on the field more than the offense and are behind in games, the defense fails and gets tired. They still however are the 5th best offense in terms of yards but Cousins needs to not turn the ball over so much to take leads and keep them. It’s a battle of 2 bad teams and you can’t trust neither of them even with home field advantage. I will however go with the better defense and more explosive offense. Take the Redskins to win with the points, but it will score in the Under. Redskins 24-14. This game is a very interesting one. Austin Davis has looked really good filling in for the injured Sam Bradford and the Seahawks just got beat at their house by America’s Team. The Rams are winless at home but not for lack of effort or blowouts but stared some really good teams dead in the eyes and went toe to toe all four quarters with them. They went back to back weeks in the NFC East with the Cowboys and Eagles and lost by 3 after leading at the half to the ‘Boys and damn near came back on the Eagles posting 14 points in the 4th and holding the Eagles to 0 in the same quarter. Last week it was the 49ers in which they had a 14-10 lead at the half. Their issue is just maintaining consistency through all four quarters. Confidence has to be there. They have the 7th best passing game in the league and the defense being pieced together through injuries has stood up well enough to keep the team in it each game. The Seahawks were caught napping last week and don’t let that final 30-23 score fool you, it was a dominating game for the Cowboys. Without the blocked punt returned for a TD, you’re talking 30-16 with just one lonely offensive touchdown either way. The Hawks were severely beat in TOP by about 15 minutes and only converted 5/13 (39%) 3rd downs and could only turn out 9 first downs and only 209 total yards. This can’t continue and an embarrassment like that is what motivates a team, especially with a defense like the Hawks. The Seahawks have only one way to go, up and they will get a fight trying to get back on track. Again, I hate to give team a TD to start the game especially at home, so you have to think about how worthy your pick in this game would be and maybe look into the record of the Hawks the last couple of years giving up 6.5-7 points. I still think the Hawks will win but Seattle is a different team, mostly on offense, on the road so they win but the Rams cover the spread +7 and this game will score in the Over. Seahawks 24-21. Blake Bortles showed some growth, control and consistency last week all while only throwing 1 pick compared to his 2 average per game. He almost pulled out their first win of the year, albeit a bad team, but looked much better. I’m still torn on wether or not he or Chad Henne gives the team a better chance to win each week given the lack of experience from Bortles and how similarly their stats look. Chad usually throws as many picks as TD’s but is 3-1 TD-INT’s this year and had a banged up receiving core this year. The browns are scrappy. Hoyer’s won’t pop out at you as amazing but he gets the job done. Last week he completed about half of his passes but had 200+ yards on 8 completions for over 25+ yards per completion! which is awesome. The Browns keep games close on limiting mistakes. They’ve turned the ball over 5 times but have only caused 2 on their defense. They complete less than 40% of their 3rd downs but do remember that they played some good defenses, The Steelers twice, the Ravens and Titans before their free fall. The Jags are no pushovers themselves and will put up a fight. Cleveland isn’t a team I ever imagined getting a line like this and it’s tough to take them. Take the Browns to win but the Jags on the points and this game will score in the Under. Browns 17-14. The Panthers are coming off a pretty good morale victory, going to Cincinnati and coming out with a 37-37 tie. The Panthers mustered 29 first downs, 2/2 on 4th down, 431 total yards and ran the ball for 147 yards on 34 carries averaging 4.3 yards per carry (mostly Cam running the ball). The defense caused Andy Daulton to throw 2 picks as well. The reason that the Panthers needed to go for it and make it on 2 4th downs was because they only converted on 8/17 3rd downs and had 8 penalties for 6o yards. They will need to go to Green Bay and will have to convert more 3rd downs and get 431 yards in regulation without the help of overtime. The issue is having Cam taking more carries, how will he hold up and be a consistent passer if he has to carry the ball 17 times? The Packers on the other hand, escaped the grip of the Miami heat and Dolphins defense. They barely won even after causing 3 turnovers. They say that heat in Miami changes good teams that aren’t used to playing in it, I thought it was a joke, it’s the real deal. The Packers showed up, kept the ball moving with 27 first downs, and still managed to be down until the very end of the game. The rushing game which blew up the stat sheet last week was pedestrian at best and Rodgers completion percentage was low but still managed 3 TD’s. The key question for Green Bay is how will their defense do against Cam? They faced 2 two-way quarterbacks the first 2 weeks and lost against one with weapons and won against one without. Bettors are very afraid of favorites giving 6.5 or more and rightfully so. 11-11 are favored teams giving 6.5 or more. In this one, take the Packers to win with the points and expect the score to go in the Over. Packers 34-24. TV: 4:25 p.m. ET, FOX. LINE: Raiders +3.5. O/U: 46. Yes! I’m back in the winning record column and trying to get back to 60% winners. 9-6 record last week breaks a bad 2 week spell and I continued my dominance of Monday night picking and staying up on Thursday night games as well. Shown will be my picks, current records against the spread and the over/under and will have Colin Cowherd’s picks from his dismal week 6. SPOILER ALERT!!! : The Sharps make a come back of sorts. I’m feeling pretty confident coming into this weekend so lookout for my Sunday picks and of course, my practically guaranteed Monday Night pick. Enjoy your Thursday my friends! Disclaimer: The featured image does not depict current NFL or College football betting lines, it is merely for show and the entertainment of this blog. The writer is not subject to any losses if bets are placed on the teams above in the featured image because of the lines shown in the picture. The picture depicts lines from 2009 and are not current lines for this weekends games. The Pats are back, and the Jets are back…in the cellar. Rex Ryan chose to go with Geno Smith last game and guess what happened? It still didn’t result in a win. Not that Michael Vick will give them a better chance, given his turnover issues, but switching the QB in the middle of a tough season like the Jets are having can bring life to the team for at least a game or so. Vick is a likeable guy and veteran leader on the team and having him start this game gives the Jets a chance, a small one but none the less, a chance. The main issue for Geno was that he could only do so much when your GM doesn’t put weapons around you to help the college to pro transition. Yeah they got Eric Decker, but when you start a season over $23 million under the cap, that just tells the team, you couldn’t find anyone to come and play in your system and it spews that you do not care about being competitive this year. The Jets offense is sputtering, having trouble in numerous areas like getting to 20 first downs, more than 300 total yards consistently, turnovers, and just the Passing game in general. You have the 32nd, worst in the league, passing game going up against the leagues 3rd best pass defense. Not to mention, Tom Brady and the Pats offense is back. Brady had his first 300 yard pass game and 2nd straight over 275 yard game. In the weeks leading up to that Bengals game, Brady struggled to get close to 250 yards! The Pats defense also pulled out 5 sacks last week. This one will not be pretty for the Jets. They are 0-5-1 against the spread this year, and the losing streak will continue. The line may hit -10 for the Pats but whether it’s that or the line at the top, -9.5, take them to win with the spread and in the Over. I hate swallowing a TD or more in points but the Jets are that bad and the Pats O is back and their defense is much tougher this year. Patriots 31-17. All of the talk about Jim Harbaugh not getting along with upper management and possible locker room issues because of his style of coaching, it hasn’t slowed the team down much. They are still performing and winning. Kaepernick after the Chiefs game stated that he would go to war for him any day of the week. If you have the leader of the team in your corner (at least to the media) then to me that means the team at least respects what his expectations of the team are. Speaking of coaching, is Jeff Fisher who lost his leader (Sam Bradford) and top defensive lineman (Chris Long), has had some close games recently and almost beat a Cowboys team a few weeks ago that just beat the Seahawks in Seattle! That is saying a lot about Austin Davis. Yes, he is virtually a rookie given that this season he ahs seen his first regular season action but he’s held his own. In each game he has improved the yards he’s thrown for and went the first 2 weeks with no TD’s but has thrown 6 in the last 2 while only throwing 3 total INT’s all year. They beat Tamps, lead most of the Cowboy game and nearly game back to beat the Eagles last week. Don’t sleep on them especially since he is completing almost 68% of his passes and has had back to back 300 yard games! They may not have faced top tier defenses but don’t be surprised if they hang in there with the 49ers. The 49ers on the other hand, have suffered in the passing game and have been relying on the feet of Gore and Kaep. The Running game is averaging 145 yards per game which is 4th in the league. Those 2 have averaged 4.7 and 4.8 yards per carry and throwing the 3rd team leading rusher, Carlos Hyde, in there, he’s averaged 3.9 yards per carry. There issue is getting the ball into the end zone. They have just 10 total TD’s on offense and that’s partly due to only completing 47% of their 3rd downs, not keeping their drives alive. They have the players to make the plays but Kaep hasn’t been playing like the last 2 years, only averaging just over 200 yards per game. In a head to head matchup, take the 49ers. The spread is a little scary because you would think that the 49ers could win this one easily but Austin Davis has come around and played very well the last few weeks. I still would take the 49ers to win with the points -3 and to score in the Over. If it’s close, I think they still find a way to win. The funny thing is last year these 2 played 9/26/13 in St. Louis and the line was virtually the same; the 49ers covered the points and scored in the Over (35-11). 49ers 28-24. If you didn’t check on Colin Cowherd’s picks, he had just his 2nd losing week of the 6 so far. 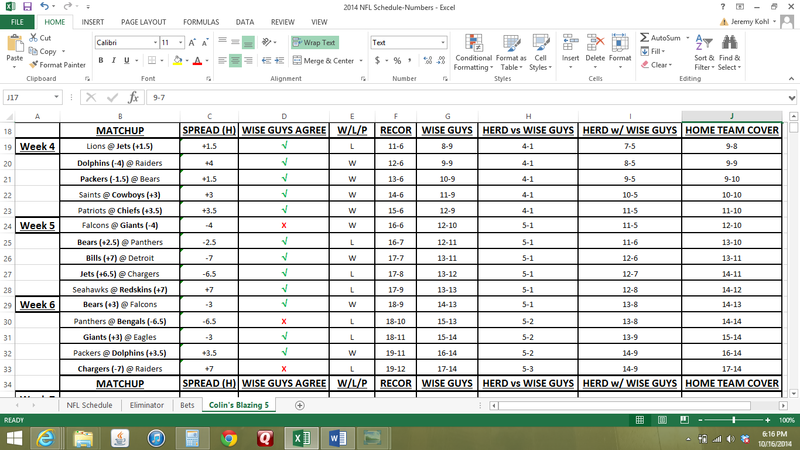 He’s still picking 61% (19-12) on his picks to 58% (52-38) on mine but I am picking all games to his selective 5. He picks some tough ones but some softies to choose from as well. The line history on this game tells you a lot about how unsure Vegas is with this game. They want to say that they think the Jags will get their first win against another terrible team but Bortles has thrown 2 picks each game he’s played. For it to swing from -7 to -4 to -4.5 back to -4 for the Titans, while not adjusting due to a star player being injured, just shows that they may be making this bet look too wild for many to bet on. That is probably because they want to favor the home team (Titans) but think the Jags can pull off a win especially covering the spread if it’s reasonable. That being said, neither team has played well, but Bortles seems to be coming around slowly (minus the 2 picks he seems to throw every game). He was able to hook up with 9 different receivers which shows that he is still trying to find someone to groove with and mesh with as his go to guy. The defense however, has picked it up. They only allowed the Steelers to score 17 points, recorded 4 sacks, held them on 8/16 3rd downs, and the tandem of Poslusny/Cyprien accounted for 23 tackles and a sack, 34% of the teams 67 tackles. Their main issue is the non existent run game. The Titans, outside of their week oem win, has been horrible. Last week they seemed to pick it up offensively but Locker left the game and didn’t return in the 2nd quarter. The Titans scored all of their 28 points in the first half and lead by 25 at one point, probably the best half they’ve played all year. But them game isn’t won by the half and the Browns made the necessary adjustments to come from behind and win it. Look, the Titans probably will have Whitehurst in and half allowed on average, 32 points per game. That’s a ton of points and I think the Jags can pull out at least 14 and hold the Titans with their beastly defense. Take the Jags to win with the points and take the Under. Jags 21-20. Well the Buccs seem to have turned the ship in the right direction with the QB change. Not many people thought they’d keep it close in the Superdome against the Saints, me included. They kept a bunch of drives going with their 20 first downs while they caused 3 Saints turnovers, all Drew Bree’s INT’s. Some quick fixes are needed for them to win games like converting on 3rd down (just 3/9 or 33% last week), 15 penalties for 113 yards, which is an unreal figure and probably took away their win right there and having 10:30 minutes time of possession LESS than the Saints. Fixing that and Vincent Jackson having another amazing game like last week (4 rec – 144 yards) will keep them in close games like this last week. The Ravens did a lot of things that can win you football games last week like causing 4 turnovers, averaging 6 yards per carry, and having a punter do work averaging 48.4 yards per punt on 5 punts. But they really shot themselves in the foot by their own turnovers (2 fumbles lost and a pick), allowing Indy to keep the ball for a crazy 38:43, and only completing 1/3 4th down attempts because they could only muster up completing 1/11 3rd down attempts. That’s just pitiful! Flacco has to play better (22/38, 58%, 235 yards, 0 TD’s/1 INT), and they need to run it more to control the clock better. They had 2 running backs with just 10 carries but rattled off 72 yards and a score (Forsett 6-42 & TD, Pierce 4-30). The line has to be better though for Flacco, giving up 4 sacks for a total of 38 yards doesn’t help either. They are 3-2 and need to turn it around which they do against the Buccs but it will be a tougher game than some will imagine. Take the Ravens to win and cover the spread but barely and in the Under. Ravens 21-17. Geno’s time in New York is on a rocky patch but when Vick came in (which the fans were calling for), they were probably wishing Geno was back in. Not good for Rex Ryan if he can’t find a QB to win games. Geno probably shouldn’t have been started all of last year but Sanchez was injured and on the rocks with his play as well at the time but you want a guy in there that gives you the best chance to win. Mistakes and inconsistency will result in another benching, can he stand up the pressure that is the Broncos and keep up with the scoring? I tell you what, 11 first downs and being 1/12 on 3rd downs aren’t going to cut it, ever! Would you put your money on that? Maybe their defense but they won’t withstand 60 minutes of Peyton. Denver’s defense even made an appearance last week, holding the Cardinals to just 9 first downs, 3/16 on 3rd downs and only allowed 215 total yards! The offense was pretty amazing as usual, holding the ball for over 35 minutes, 568 total yards, and 24 first downs. Peyton alone threw for 31/47 (66%) 479 4 TD’s but also 2 picks, but anytime Peyton has a game like this, expect the scoring to be plentiful and the blowout to be on. They didn’t need to run much but when they did, they averaged 3.3 per run with 3 different carriers averaging 4 yards or more. D-Thomas had a blazing game as well, 8 catches for 226 (28.2) and 2 scores, with his compliment Emmanuel Sanders catching 7 for 101 (14.4) and Julius Thomas hauling in 6 for 66 (11.0) and the other 2 scores, just an outstanding receiving core that are on fire and give Peyton so many options to choose from and by the way, you didn’t see Welker on there who caught 7 for 58 yards. 3 receivers over 6 catches and 50 yards each! Wrapping your mind around that is hard because it’s unheard of. The line on this game opened in some places at 5 or 6 went to as high as 10.5 to 10 to 9.5 back to 10. Those swings just tell you to stay away from games that throw a game around like that. The Sharps don’t know what to make of the Jets since they were shutout last week 31-0 and the offense just laid down. However, this is the 3rd best pass offense in the league going against the worst pass defense in the league. Take the Broncos to win, to cover and to score at least 35 to help this one score in the Over. It will be a blow out. Broncos 38-20. This is a tough one because Teddy Bridgewater is back and this will be a first look for the Lions at him. The last time the Vikes were at home with Teddy at the helm, it was an upset over the Falcons. The running game for the Vikes can do damage but they are going against one of the better run games in the league (3rd) and a pretty decent pass defense (6th). The Lions seem to be very different on the road but against the Vikings in 8 career games, Stafford has one of his better TD/INT ratios and completes about 64% of his passes against them. The big question is how will he do without Calvin Johnson in the lineup. He was listed as doubtful with his week 5 ankle injury and is expected to miss this game. That opens the door for opportunity for Teddy. I think he puts a double threat on the Lions that they haven’t really faced this year and being fresh from sitting out last week will help. They will pound the ball on the ground but not as effective as previous games and will make it a game. Having just a 2.5 point line helps me make up my mind on this one. If you got the line earlier in the week, the Lions were giving up about 1.5 points but with Johnson most likely sitting, that line flip flops so I hope you locked it in when the Vikes were 1.5 point dogs. I still think they win at home and cover the -2.5 point spread but in the Under. Vikings 20-17. The Pats line is still recovering from injuries and they are wondering who will be snapping Brady the ball. The hardest thing to do is handle the ball in between players especially snapping the ball with QB and new center. I’m sure there was extra practice all week on it but I’m going to say that the over/under on snapping blunders will be over 1. The Bills have re-found their confidence under the helm of Kyle Orton. He’s been able to give the Bills a consistent passing game like they haven’t seen with EJ Manuel. Orton has a 69.8 completion percentage and going against the 3rd best pass defense in the league, it will be tough but if anything, count him in for being consistent. He’s looked for a starting opportunity which is what brought him out of retirement and he’s got his chance and will continue to make the most of it this week against bitter rivals (bitter due to being 2-10 last 12 home games against the Pats). Sammy Watkins looked good last week with 7 catches for 84 yards. He will score a TD this week against the Pats, the Bills will be keeping this one close because they really want to beat Tom Brady. The Bills are 2nd best in the league against the run; the Pats are 14th in the run offense. Tom will get hit and pressured. Take the Bills to cover the points and to win given that this is probably their best opportunity to pull off a win against the Pats in the last decade. This game will score in the Over. Bills 24-21. The Bengals have covered 11 straight home games ATS by an average of 12 points! AJ Green was a last minute scratch but I’ll stick to my guns since the line hasn’t moved. Take the Bengals to win but giving up a TD to Cam is too much so take the Panthers to cover in the Over. Bengals 27-24. Close game as far as points but the Browns want revenge from the week 1 thrilling loss. Take the Browns to win at home with the -1 point and to score in the Under. Browns 24-21. Experts are saying the heat in Miami may make a difference in this one and if your betting on the heat helping the Dolphins and not betting on the Dolphins to try and win, then you need to rethink your betting strategies. Packers take this one easily over a weak Fins team and big. Take the Pack -2.5, it may even move to 2 before kickoff and to score in the Under. Packer 28-20. 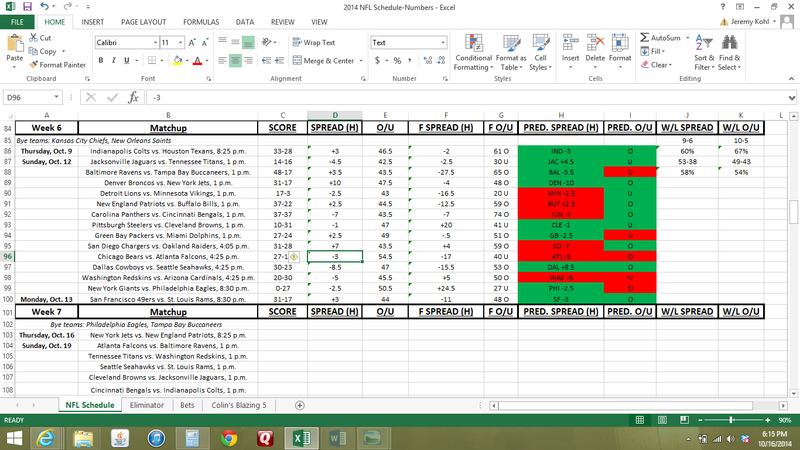 Chargers will be too strong, I don’t like taking TD spreads but the Raiders are baaaad. Chargers 31-17. Cowboys are not getting any credit in this one with an +8.5 underdog spread! That’s nuts. Romo is back, the line is doing a great job and they will keep it close in the always tough Seattle. I was close to calling an upset alert but you can’t go against the 12th man. Take the Seahawks to win but the ‘Boys to cover the +8.5 point spread in the Over. Seahawks 31-24. The Redskins will bounce back this week. They actually kept the game with Seattle last week within range. the Cardinals got beat up a bit by the Broncos last week and the Redskins D will keep pressure on Stanton. Take the Redskins to win with the points as well +5, and in the Under. Redskins 24-20. Eagles offense isn’t what it was last year. They are getting outscored and seem to only really play 1 half of football. The Giants have gotten much better since their first 2 weeks. This will be a good one. Still, 4-1 is 4-1, the Eagles seem to find a way to win and at home in prime time, take the Eagles to win and cover the -2.5 spread and to score in the Over. Eagles 30-27. Bears +3, Bengals -6.5, Giants +3, Dolphins +3.5, Chargers -7 (he doesn’t like the Chargers game). The Sharps disagreed with the Bengals and Chargers picks.